Get crafting to create this easy 3D Christmas Tree Pop Up Card that friends and family will fall in love with. 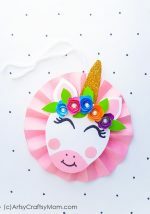 These cards are easy for kids to make and the Pop up three-dimensional element is sure to a big hit. We love Christmas! 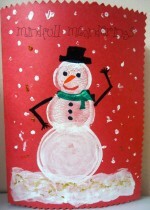 Whether it’s making miniature snowmen, gift tags , ornaments or printables, we have made them all. When we saw this pop up card over at Childhood101, we fell in love with how simple it looked and made our own. Card stock in blue or a ready card template in blue. Start by folding the letter sized cardstock [8 inch by 11 inch] in half to make a card. If you have a ready blank card, you can skip this step. Trace a 5 inch semi circle using a pencil and a large lid on the green construction paper. Cut out and fold into half and another half to form 8 sections. Using a scoring tool or a dull pen, fold along these lines in an accordion style. We painted the card using brush pens and added dots using chalk markers to decorate our tree. 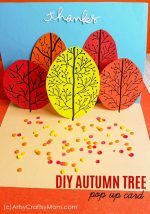 You could add punched paper dots , glitter glue dots or even use sequins to decorate the tree. 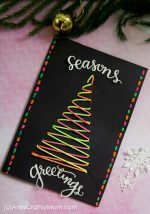 Leaving some space at the top & bottom, carefully stick the two ends of the tree on opposite sides of the card while carefully aligning the middle fold at the center of the card. Close the card and press slightly. Now cut out a 2 inch brown square and fold in half. Now fold a small section of both ends inwards as shown. Glue only the edges and carefully stick to the underside of the tree. Cut out small rectangles from the construction paper and fold in half. These are your mini presents and will hold your holiday messages for the family. It’s super fun to create a present ( card) for each member of the family and get them to write a personal message. using small strips of colored paper, decorate each card to look like a wrapped present. Carefully glue the underside of the card below the Christmas tree making sure they are easy to open and are not blocked. Glue snowflake cutouts and 3D Christmas Tree Pop Up Card is ready. Fill each mini card with season’s greetings and watch your loved ones be surprised when the tree unfurls. You’ll enjoy checking out the other Christmas cards created in this series! 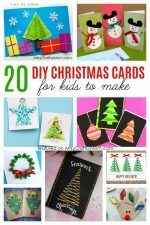 Thirty bloggers will be sharing their kid-made Christmas cards with you, so make sure to check out the entire Kid-Made Christmas Card Series (hosted by Mum in the Mad House). 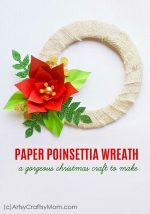 Love this Christmas card idea! It is so much easier than you think to make a 3d Christmas Tree! Thanks for sharing! Love the pop up card idea. It is simple yet so bright and beautiful.